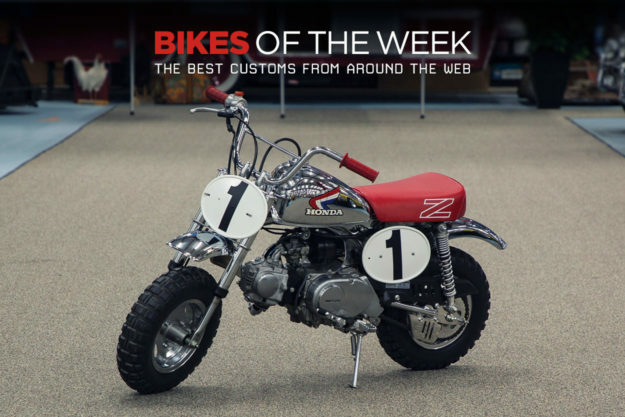 A Triumph styled like a Citroën, Norton’s new Atlas 650s, and a retrospective look at Honda’s racing Monkey. Are you ready to get weird with us? 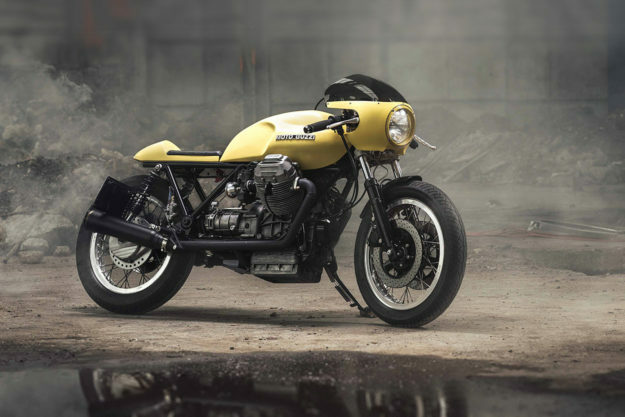 Moto Guzzi Le Mans 850 by Gas and Oil Motorcycles The Czech workshop describe their experience customizing this Le Mans as a ‘brush with royalty.’ They clearly respect the Italian marque highly—and they’ve done it justice with this purpose-built cafe racer. Shop founder Matěj Sysel wanted to build a traditional and classy café, but with modern touches. The donor wasn’t in a great state though, so the team first had to overhaul the motor—and while they did, they bumped it to 1,000 cc too, just for good measure. Other upgrades include Dell’Orto carbs and SuperTrapp silencers. The bodywork is a mix of old and new. Gas and Oil kept the Le Mans aluminum tank, then shaped up an aluminum tail hump to complement it. It turned out to be quite a process, and the guys eventually had to rope in a friend to help finalize the rear end. The fairing’s an aftermarket fiberglass number; the guys tweaked it, and built their own brackets to hold it. Honda Monkey Z50R Honestly, who doesn’t love the Honda Monkey? Next to the Honda Dream, the Monkey is probably the most beloved two-wheeler to roll of of Big Red’s factory. But no-one ever accused it of being quick. That didn’t stop people from racing Monkeys back in the 70s and 80s. 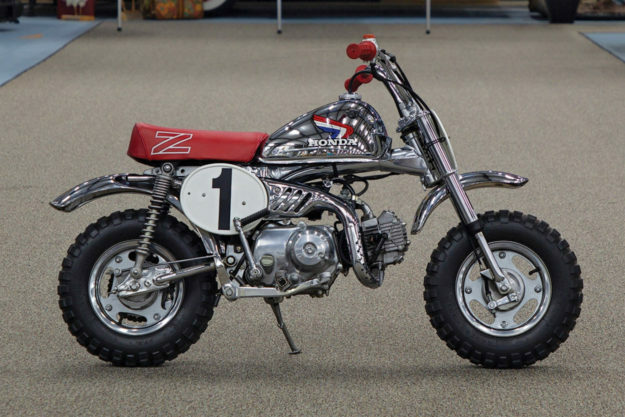 And if you were racing mini motocross at the time, the Z50R was the Monkey you wanted. 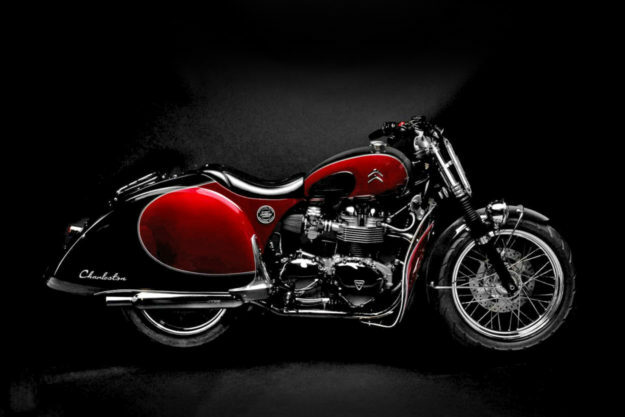 The model pictured here is a Z50RD ‘Christmas Special,’ complete with its original chrome fenders, tank and bars, and up for auction next month at RM Sotheby’s. 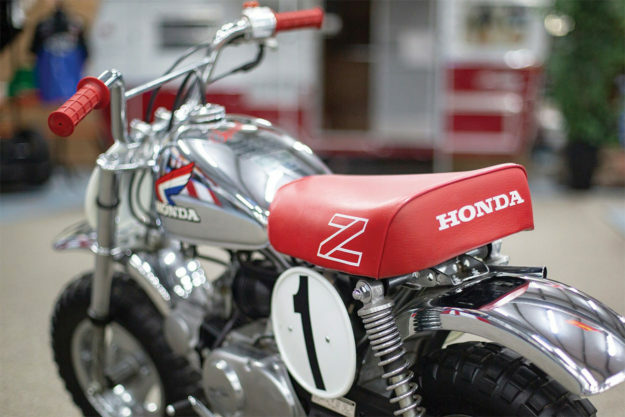 Honda made the Monkey from 79 right up until 99, but they only ever produced 3,000 Z50RDs—and they were the only model to feature these red grips and seat. Triumph Bonneville Citroën tribute by South Garage Here’s something you don’t see every day: a British motorcycle, dressed up as a French car, built by an Italian workshop. Milan’s South Garage Motor Co. built this curious machine as a tribute to the charming Citroën 2CV Charleston, celebrating the 70th anniversary of the 2CV model line. They started with a carb’ed Triumph Bonneville, and set out to execute the idea without hacking up the base bike too much. 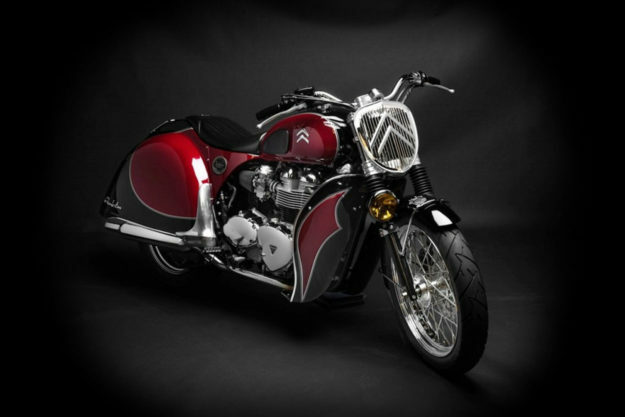 The tank is original, and as far as we can tell, so are the frame and exhaust system—because they already matched the style South Garage were after. The big changes are the hand-formed wheel ‘arches’ at the front and back—designed to mimic the lines of the vintage Citroën. The rear arches have been shaped to co-exist with the exhaust cans, and the setup’s been topped off with a new seat. 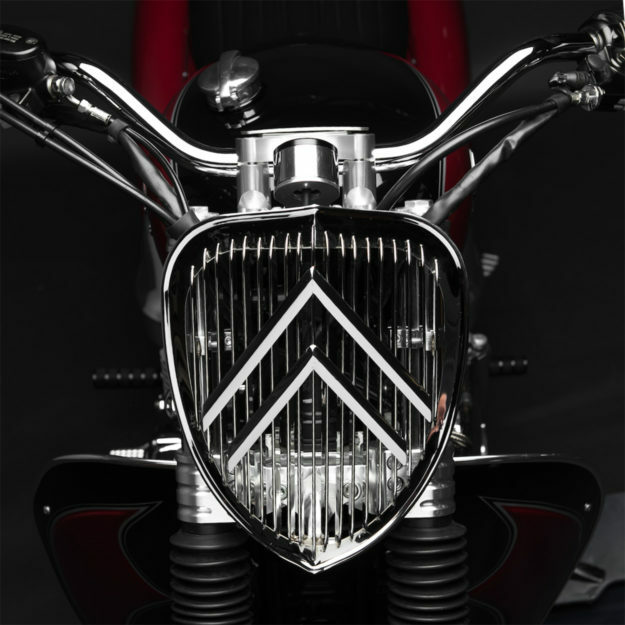 There’s a chrome luggage rack at the back that mimics Citroën’s iconic double-V logo, and a set of Citroën logos on the tank. 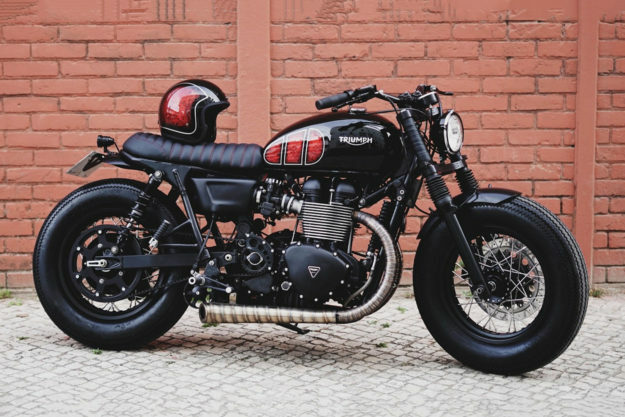 Triumph Bonneville T100 by Unik Edition Luís Costa and Tiago Gonçalves of Portugal’s Unik Edition have been building bikes as a side hustle for a couple of years now. 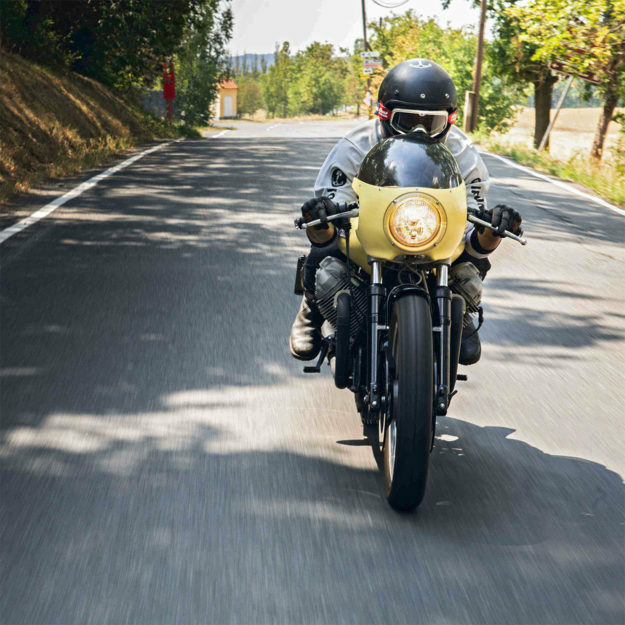 But this year, they went pro—and this 2014 Bonneville T100 is their second build as a full-time operation. 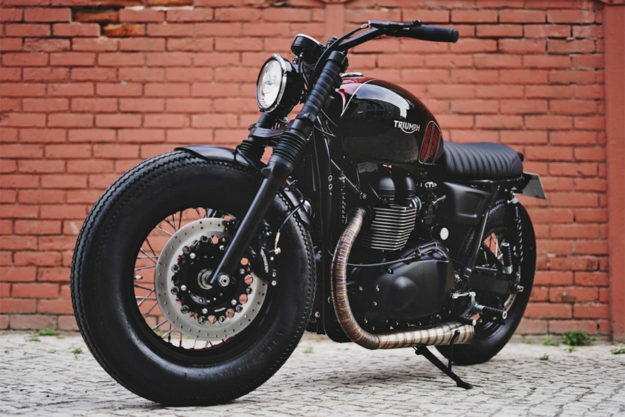 Dubbed ‘Leonor,’ it’s a slammed and broody bobber with a host of finer details. The stance is spot-on, thanks to a pair of 16” rims wrapped in 5” wide Firestones. Unik had to pull off a couple of front-end mods to squeeze the wide wheel in, like widening the forks. There’s a new set of shocks out back too, and the ride height’s been lowered at both ends. Unik rewired the bike around a Motogadget m.unit, with an m.lock RFID keyless ignition. They also converted the Bonnie from chain drive to belt, and installed K&N filters and a EFI power commander. There’s a new subframe, a new seat, and new fenders at both ends. 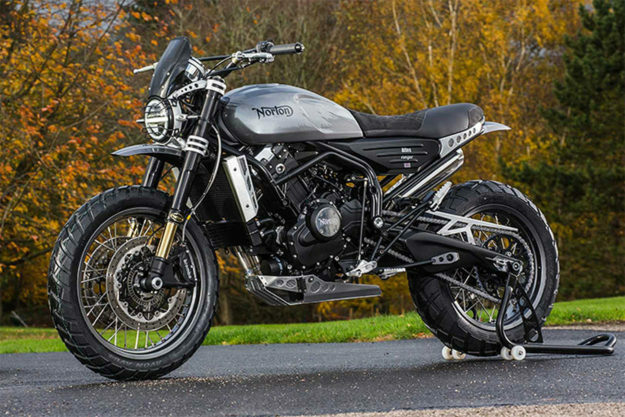 Norton Atlas Nomad and Ranger The onslaught of new models at EICMA this year was relentless. 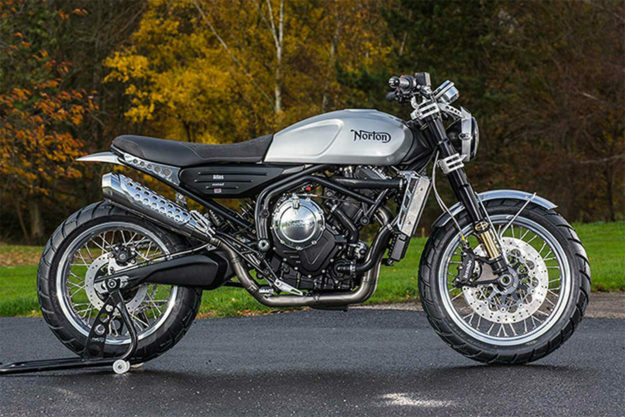 But just as the dust has started to settle, Norton have announced two new—and pretty exciting—models. 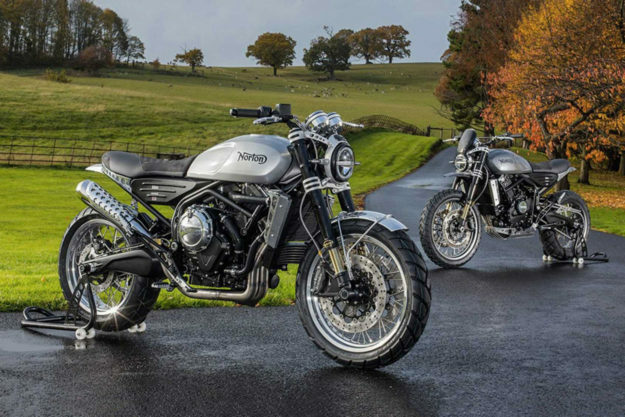 They’re effectively two variations of one platform: the new Norton Atlas. It’s powered by a 650 cc liquid-cooled parallel twin, and claims to make 84 hp and 64 Nm. It’s equipped with a steel trellis frame, Norton’s own ‘Roadholder’ suspension, and is said to weigh 178 kg dry. The Nomad (above) is the more road-focused of the two, with an 18F/17R wheel size combo and 150 mm of suspension travel at both ends. The Ranger (below) has 19F/17R wheels, with 200 mm of suspension travel. It’s also got some clear dirt bike styling, with high fenders and a beefy bash plate. Both feature composite 15-liter fuel tanks, and Brembo brakes with ABS. 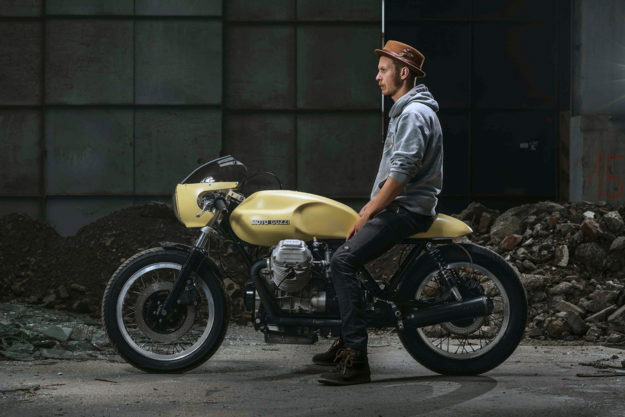 Norton are pitching it as their ‘first modern affordable bike.’ At £9,995 (Nomad) and £11,995 (Ranger), the Atlases go head-to-head with the £10,600 Triumph Bonneville T120 in the UK, but with a much smaller engine. Sure, it makes respectable numbers for a 650 and is well specced, but the T120 makes roughly 40% more torque. Looks like we’ll soon find out how much of a premium the Norton badge actually commands.